I’m so excited to have partnered with Mohawk Flooring Air.o Unified Soft Flooring (USF) to bring you an up close and personal look at their new hypoallergenic flooring! 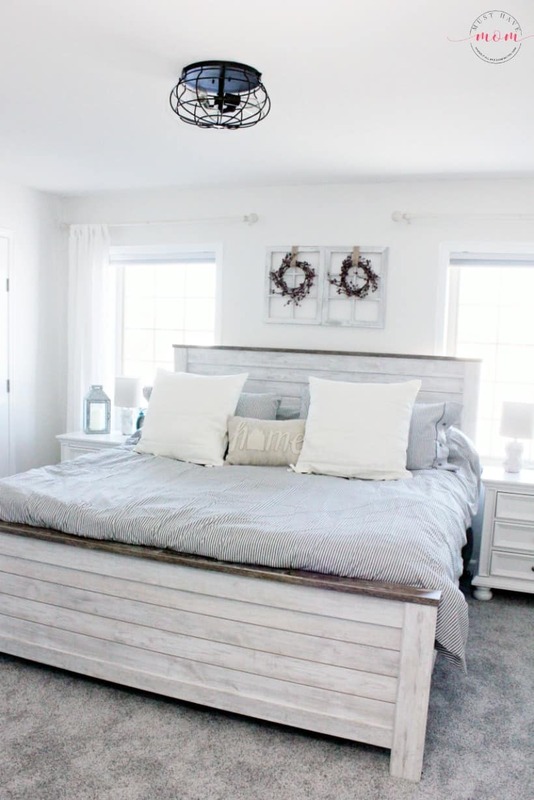 If you’re craving a relaxing master bedroom where you can unwind and have serenity after a busy day, then I’ve got the most amazing master bedroom makeover to show you. 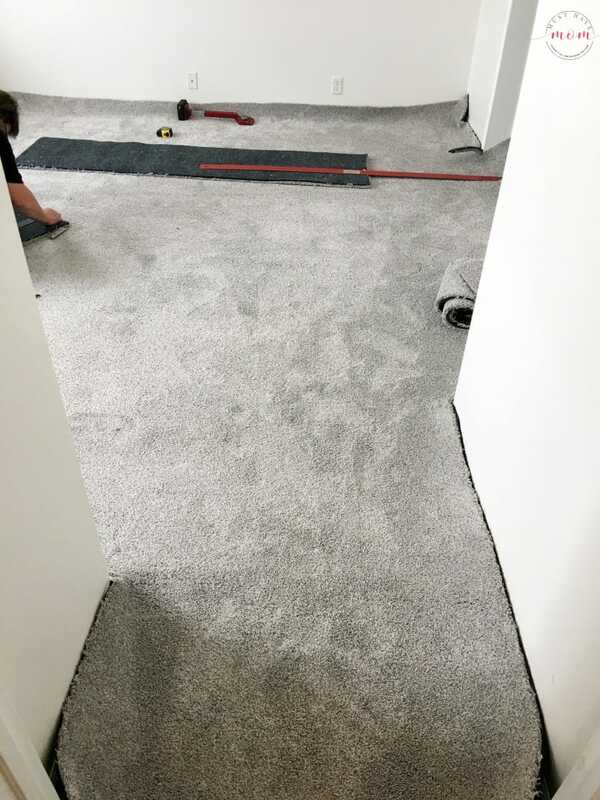 I’ll show you exactly how we created the space and why we chose a hypoallergenic carpet alternative from Mohawk for our flooring. 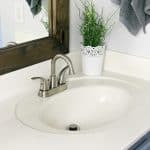 A LOT of thought went into this space and I’ll show you exactly how to DIY your own amazing makeover. 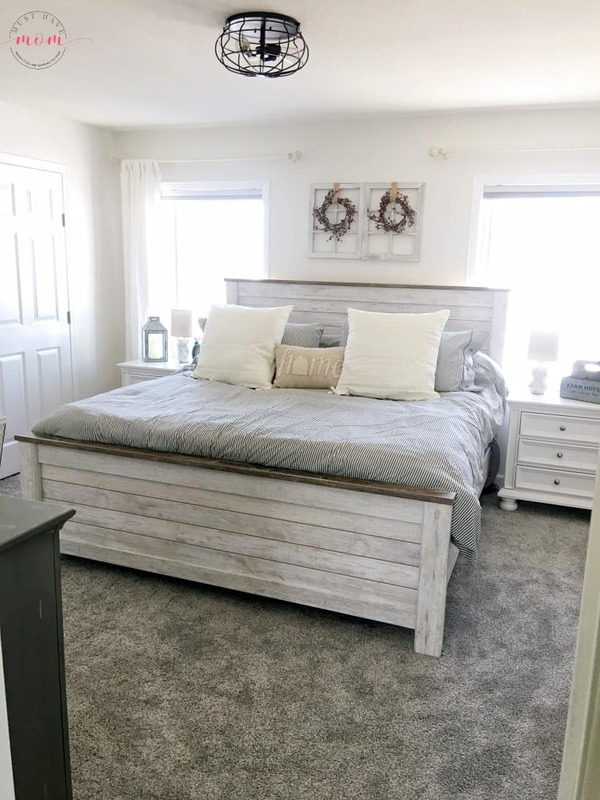 I’ve been waiting YEARS to re-do my master bedroom. We bought our house six years ago and a master bedroom I would love was at the top of my list. I wanted to make sure I did it right and loved it for years to come. I knew I wanted to go with a farmhouse “fixer upper” style. Choosing every detail was the fun part for me, but if you struggle with that then I’ll show you everything you need to know! We knew we wanted to go with hypoallergenic flooring, but I didn’t know what kind. I love stepping out of bed and sinking my feet into soft, warm carpeting, but with allergies and a child that has asthma, I wasn’t sure if we could have carpet. 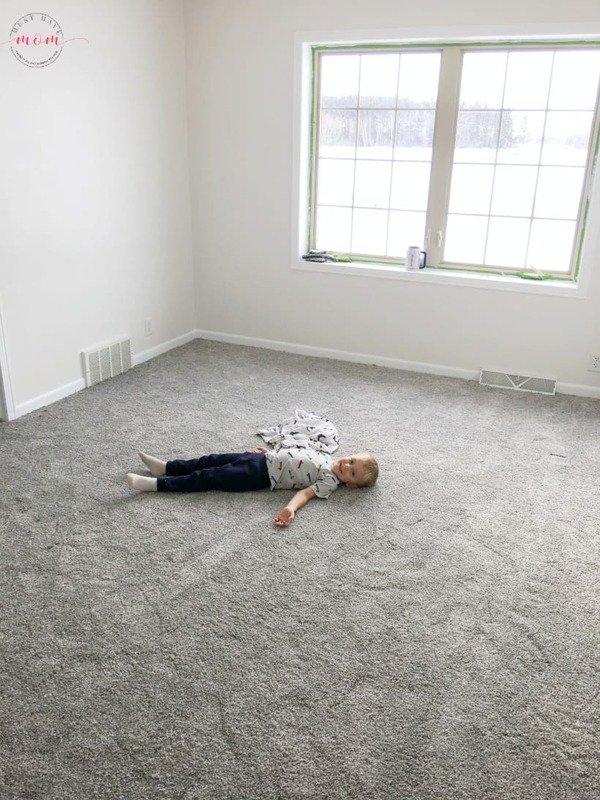 I did research on hypoallergenic carpet alternatives that were recommended for people with allergies and asthma and I found Mohawk Flooring Air.o Unified Soft Flooring (USF). Mold, mildew and other allergens require moisture to grow and spread. Air.o’s fibers and integrated cushion don’t absorb moisture, which allows it to dry faster and more completely after spills and cleaning. Air.o’s unique construction also provides superior airflow, which releases dirt, dust and soil from the floor when vacuuming, leaving you with a cleaner home. It also is easy to install, and is latex, odor and VOC-free. I can attest to the fact that there was no “new flooring” smell during installation! After analyzing all these details, we decided to use Air.o unified soft flooring for our master bedroom makeover. 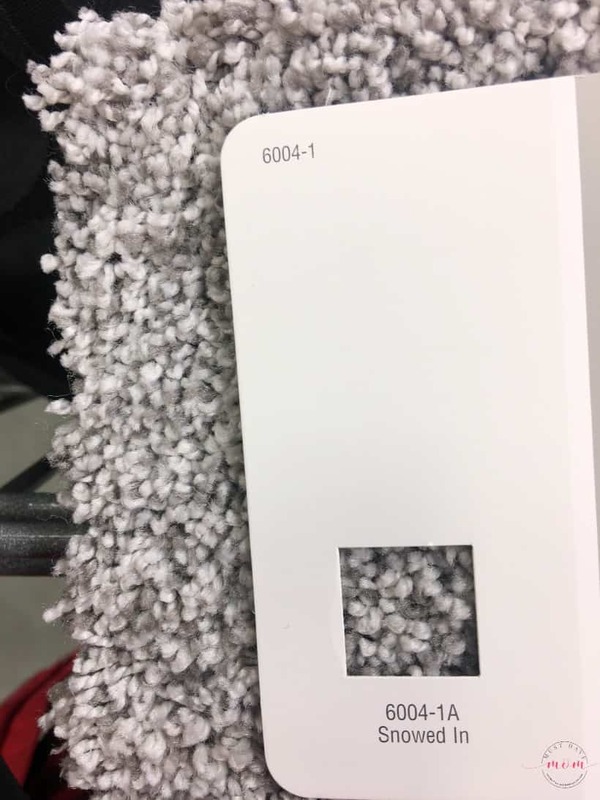 We chose the Fresh Start II in the Rock Wall color, and I paired it with the “snowed in” paint color. The installation process was really fun to see (it’s so different from traditional carpet!) and the final makeover reveal was stunning. 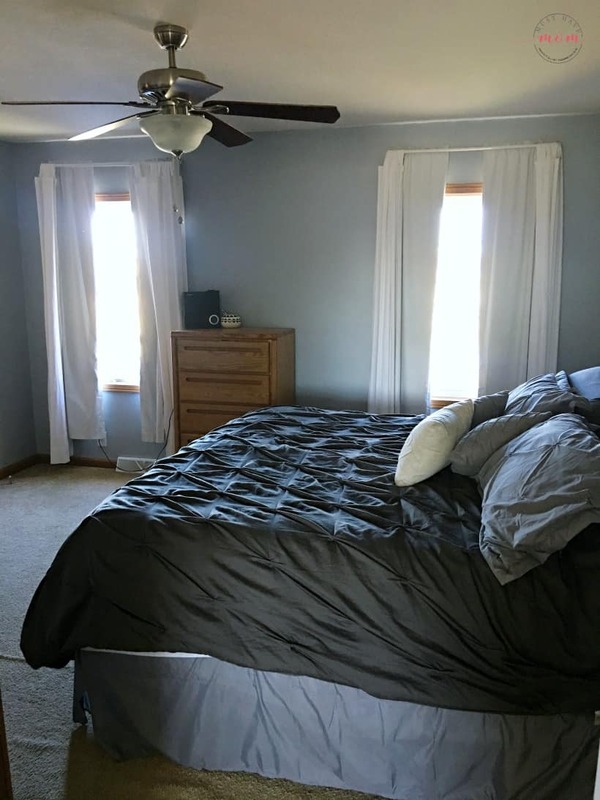 Here is a picture of my master bedroom “before” the makeover! Isn’t it dark and dreary feeling? Our furniture was all mismatched pieces we picked up here and there over the years. The carpet had a huge buckle in it right when you walked in the room. The whole room felt depressing. Our local carpet retailer, Carpet Plaza, arrived to install the Air.o flooring and they were just as excited as we were about this new product. They explained to me how easy it was to install because there is no carpet pad, tack strips, or stretching involved. It’s quite amazing! The Air.o unified soft flooring is one piece with the pad integrated into the whole design. I’ll show you how they installed it. 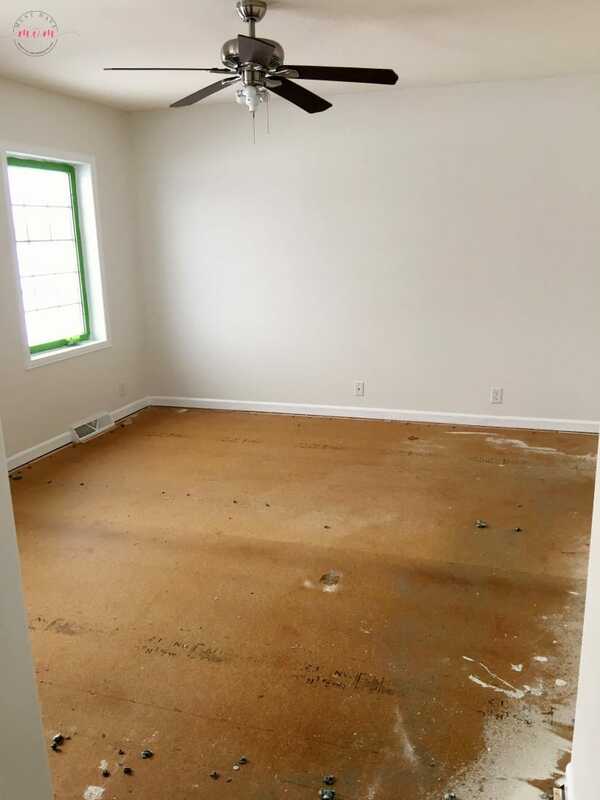 Here is the before photo of our master bedroom with all the furniture removed. We painted the walls in “snowed in” colored paint and painted the trim white before the flooring was installed. This helped keep our new flooring paint-free! The carpet installers began by removing the old carpeting and pad. 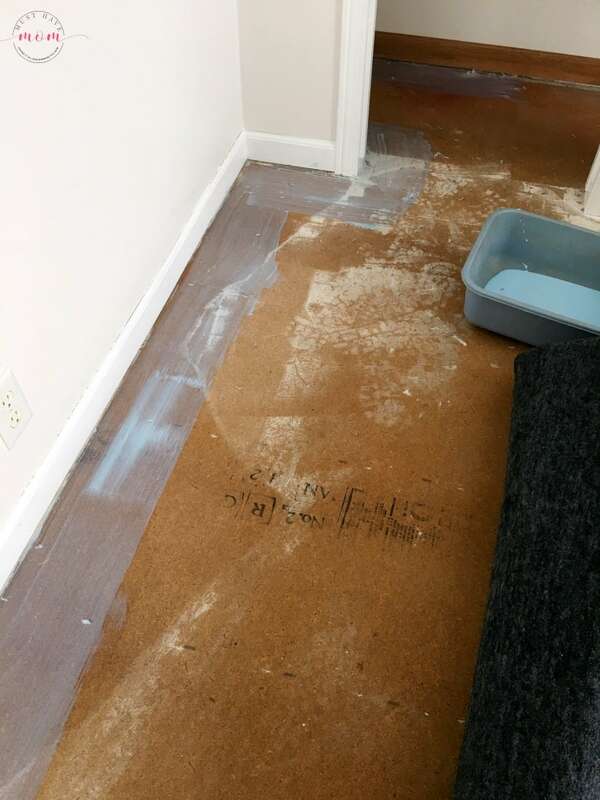 This was a bit of a process since they also had to remove all the tack strips and staples from the old carpeting. Once they finished removing the old carpeting our room was bare and ready for new flooring! They then carried in the massive piece of Air.o flooring. 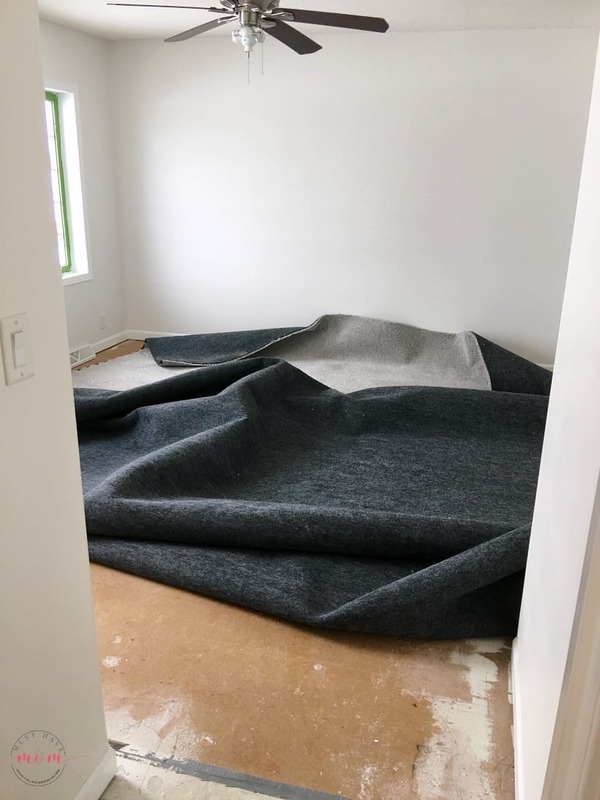 Since it is all one piece, it’s a bit heavier and bulkier than traditional carpeting, but the ease of installation makes that little detail worth it. Once they roll out the Air.o flooring then it’s time to trim it to fit the room exactly. They trim around every edge and inside the closet. 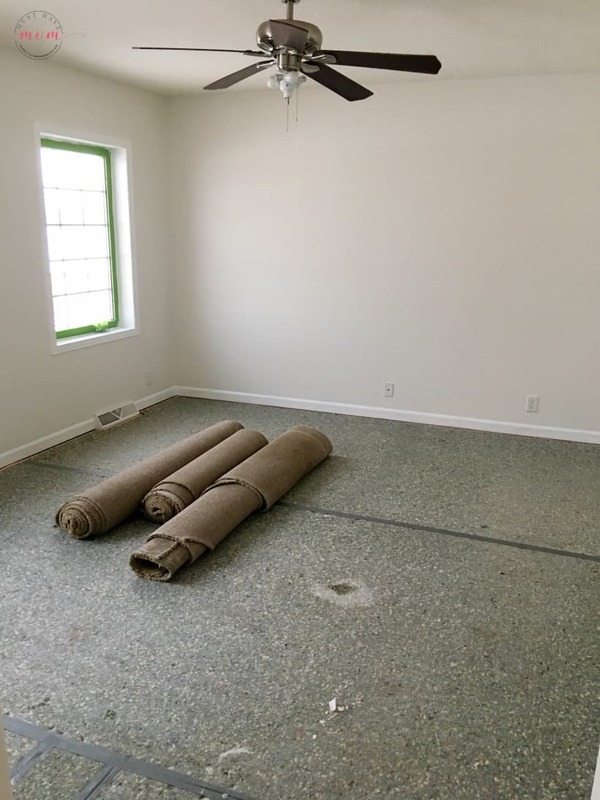 Instead of putting down tack strips and stretching the carpeting, they simply apply an adhesive around the edges of the room and glue down the carpet. 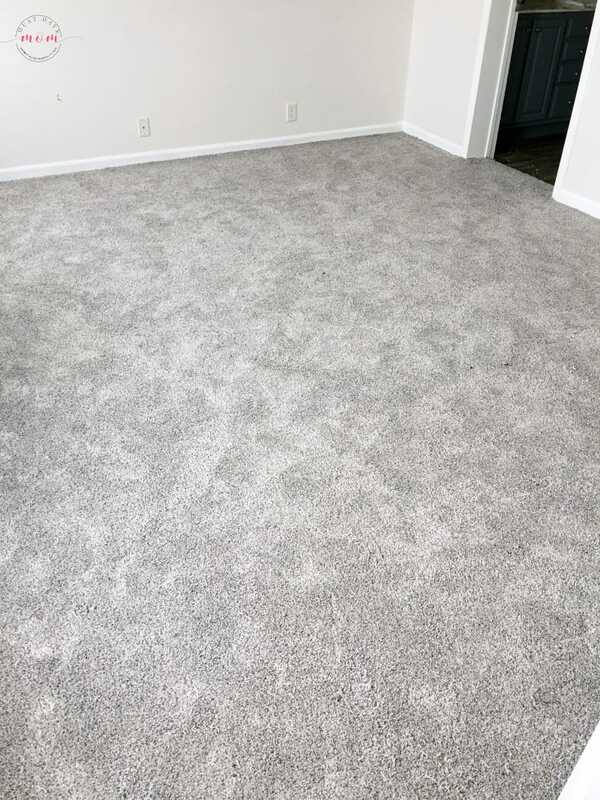 There are no tack strips and no need to stretch the carpet. The carpet will never buckle either because it is one heavy piece that just stays in place. It’s quite amazing to see! I asked the installation guys what they thought of the install process and they let me know that they really like it. It’s a lot easier for them and better for the customer too. Air.o is also the first 100% recyclable flooring and is an industry game changer! So those excess pieces they trimmed won’t clog up any landfills. Now for the fun part! 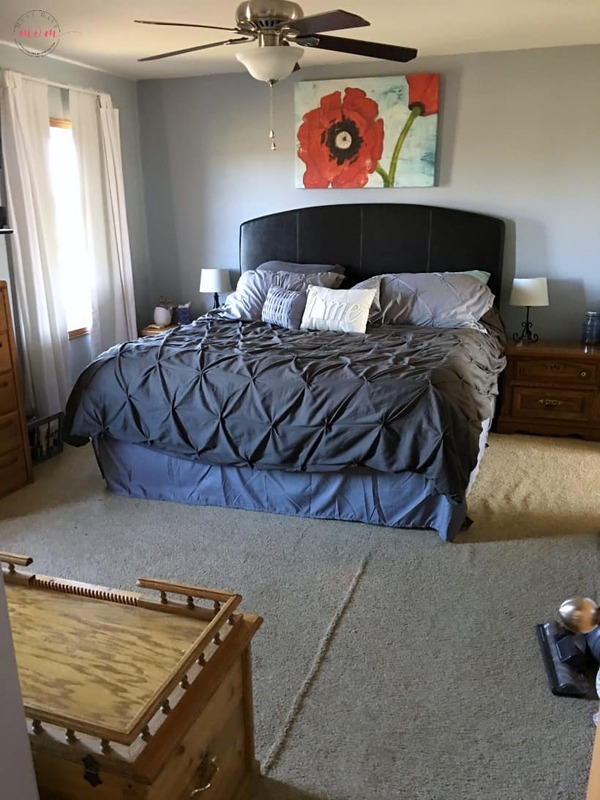 I can’t wait to show you the before and after photos of our master bedroom makeover. Once the Air.o soft flooring was installed it was time to decorate! I love that part! I picked up a new bed set, nightstands and hutch. 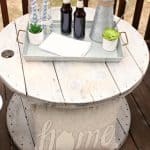 I also picked out some really fun farmhouse decor pieces. Simply changing the paint color and adding Air.o flooring had already made the room feel bigger and brighter. 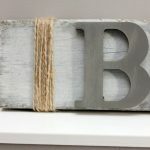 I couldn’t wait to add some farmhouse decor touches. Here is the big reveal!! Before & After!! Isn’t it stunning? I absolutely LOVE the transformation. We moved the bed from the blank wall to the wall with windows and it looks SO much better there. The lighter color scheme in the room reflects light making the room feel larger and brighter. No more cave-like bedroom! It’s relaxing and it’s my sanctuary to retreat to after crazy busy days in the land of motherhood. 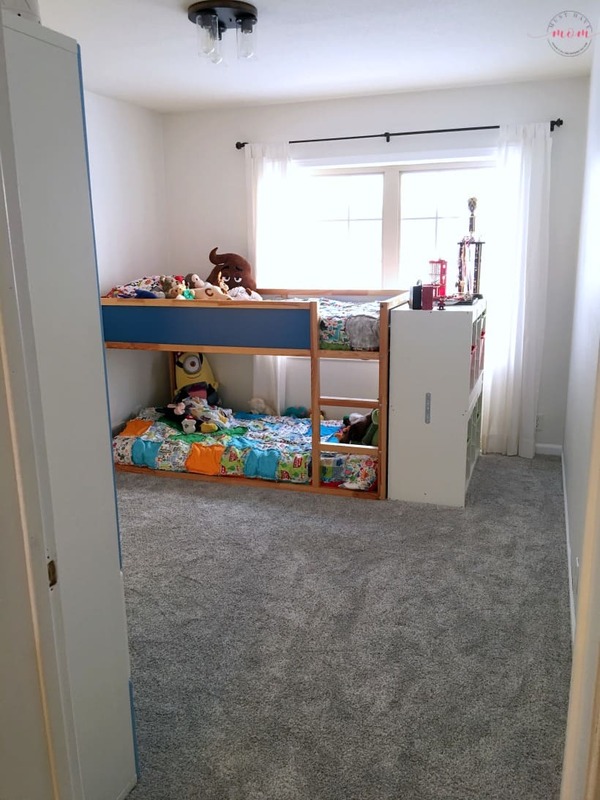 We loved the Air.o flooring so much that we also put it in our children’s rooms. 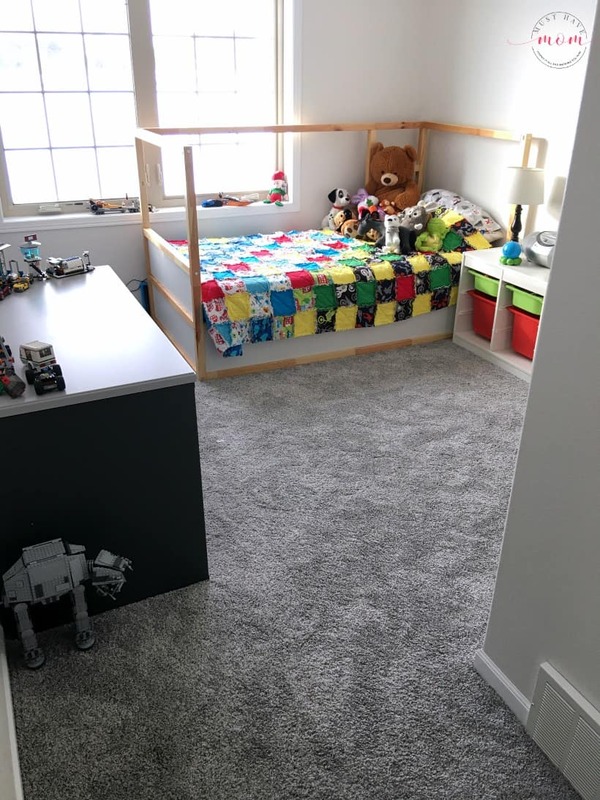 My son has allergies and asthma and I love that he now has flooring that won’t contribute to his symptoms. My kids love the soft flooring too! I’ve never seen a three-year-old so excited about flooring. He even kissed his soft, beautiful flooring! The installers were cracking up at his enthusiasm over the new flooring. Go visit the Air.o website for a chance to win $1,000 towards Air.o flooring in your home and to learn more about this hypoallergenic flooring! « Spicy Shrimp Wonton Cups Appetizer Recipe + $1,000 Gift Card Giveaway! This room is fantastic! I love everything in there, but the head and foot board are the best! Thank you Stacie!! I love the bed set as well. I love the whole feeling of this room. 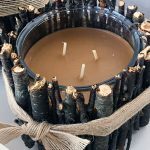 You managed to combine a cool, calming palettes with a cozy vibe that I think works really well! I LOVE what you did to this room! I want to do makeover on my bedroom! It is getting dated and old! If I could I would also redo the floor also! You did a great job! I think your flooring looks amazing! I think I’ll look into the Air.o flooring for our home. Hypoallergenic seems like a very good idea for my family. I want you to come decorate my master bedroom! This looks so amazing!!!! I absolutely love the feel of the room! The carpet is amazing!!! Haha, sure no problem! I LOVE decorating! Wow what an amazing transformation. That rug looks incredible, I’ll have to look into this for our home! The bed is so awesome! I love the entire setup. Very warming! You did an awesome job! I love Mohawk Flooring too! They have the best quality rugs that wear really well. Oh, thanks for the feedback!! Love your bedroom makeover! It looks amazing! 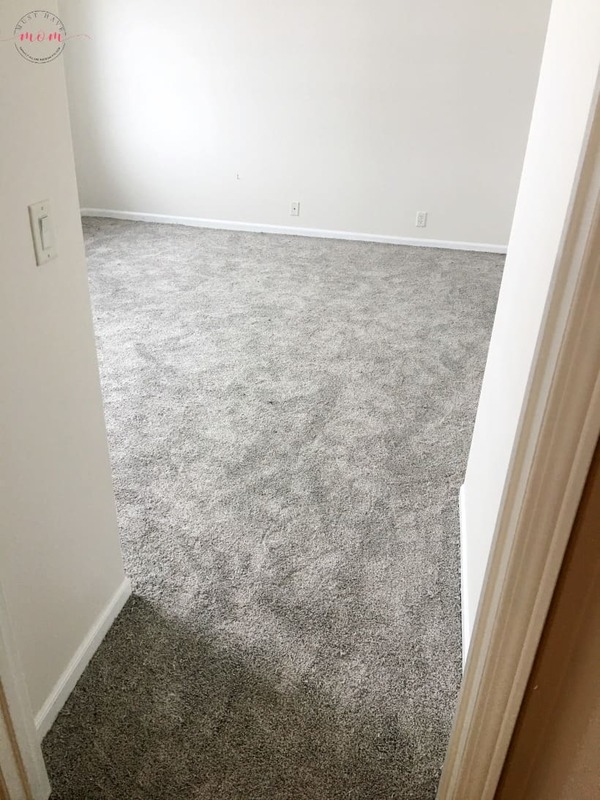 Can’t wait to look into this carpet option! What an incredibly transformation! Looks like Mohawk Flooring really helped with this reno/makeover and what a world of a difference it makes. It made me love carpet again lol. After having such thin, icky carpet before, this made a HUGE difference! I absolutely love the look of new carpet. That brand of carpet looks so soft and comfy! I bet it feels nice under your feet. Thank you! It is SO soft and cushy, I absolutely LOVE it! Gorgeous! We live in a teeny, tiny NYC apartment and are hopefully moving in July and I’ve become so obsessed with looking at before and afters. I love how bright and homey your bedroom because and the colors you picked are just perfect. Sarah, you did a beautiful job! Your bedroom has such great lighting now too! Wow. Just Wow. What a gorgeous transformation! I LOVE it!!! Beautiful! So happy for the kids, I know my family has allergies that’s why we don’t have carpet, now I am going to have to check out AIR.o! What an oasis! I bet the carpet feels divine to the toes. It definitely makes waking up and swinging your feet over to the floor so much more enjoyable!! I love that bed frame! If you don’t mind me asking, where did you find such a beautiful frame like that? Hi there! Just wondering if the carpet is still holding up well. We haven’t heard a lot of reviews and are considering having it laid in our basement. Hello! Yes, it is holding up great! Despite kids and dogs having accidents on it. It has cleaned really well when they’ve gotten sick on it. It still looks brand new! I would definitely choose it in the future if I needed carpet again. I hope that helps you!